For convenient reference, there is also a Table on a separate page showing all the direct air services - and the airlines flying them - from the six main Scottish airports. There are around 100 such destinations. Scottish airports are busy and getting busier. In 2005, the three British Airport Authority terminals - Glasgow, Edinburgh and Aberdeen - welcomed a total of over 20 million passengers. Then add to that figure the nearly two million travelling in and out of Prestwick International airport. And the number of passengers projected to be using Scotland's airports by 2030 is well in excess of 30 million. Up until fairly recently, it was a perennial frustration for both Scots wishing to travel overseas or visitors planning a business or leisure trip to Scotland that London had to be first port of call on their journey. And that extra flight not only added a much higher fare but wasted time transferring through Heathrow, Gatwick or Stansted. The serious lack of direct travel to and from Scotland did nothing to encourage or boost the economy, conference business and tourism. While there is still room for improvement, the opening of the Scottish Parliament in 1999 instilled a renewed confidence and a thirst for enterprise and innovation and Scotland was seen by many as an "independent" nation within Europe. This coincided with the development of the so called no-frills airlines - Ryanair, easyJet, Go, Buzz - now competing with the "Big Boys" - British Airways and British Midland - and the skies were open for a ready and waiting travel market. This feature covers many of the scheduled airlines flying to and from international destinations - though the busiest routes are still those to the south of England and charter holiday flights. Note that all the paragraph headings are links to the airlines' own Web sites. Full marks to Aer Arann for being quick off the mark on seeing a gap in the market between the two Celtic countries. There has been a direct flight between Edinburgh and Cork since August 2002, with a daily service except Wednesday and Sunday. The neat fifty seat ATR42 turboprop aircraft is ideal for this hop over the Irish Sea for business trips and leisure breaks. A service twice a week from Prestwick to Donegal in north-west of Ireland began in the summer of 2004. The Dublin-based carrier has long been the mainstay (with British Airways) of the Eire to Scotland route with services to Glasgow and Edinburgh. Faced with competitionfrom budget airlines, Aer Lingus has responded to the challenge with lower fares themselves. Air Canada has been operating direct trans-Atlantic flights between Scotland and North America for many years. Currently, the Edinburgh to Montreal and Glasgow to Toronto services are summer only. The French national carrier operates direct flights between Paris and the three British Airports Authority terminals at Edinburgh, Glasgow and Aberdeen. Air Scotland's scheduled services began in late March 2003 with a network of flights from Glasgow and Edinburgh to Spain. Although it carried a Scottish flag on its tail fin, the airline is not Scottish based or owned. Its current owners (Spanish company H-Top Hotels) has decided (in 2006) to rename the airline as topjetair - the use of lower case instead of capitals seems to be a modern computer-generated phenomenon. Based in Swansea, Air Wales flies services from Cardiff to Dublin and Norwich and has extended its network to Aberdeen, stopping off at Liverpool on the way. The airline serving the Faroe Islands flies to Aberdeen on a Friday morning and the return flight is on Sunday evening. The Austrian national carrier has introduced a new service from Edinburgh to Vienna, via Frankfurt in Germany. This Norwegian-based airline flies direct services to/from Aberdeen to Bergen and Stavanger. BA operates internal UK flights and also internal Scotland services via its franchise partner Loganair (who also fly to the Isle of Man). Direct flights to international destinations by this major UK carrier are thin in the air, however. There are direct services from Edinburgh and Glasgow to Belfast and Dublin. Other flights to Paris, Munich and Jersey in the Channel Islands are mainly via other airports, mainly in the south of England, although there are a few aircraft flying direct to these destinations each day - with a consequent saving in time. This low-cost airline flies from Edinburgh, Glasgow and Aberdeen to Paris, Charles de Gaulle. There is also a trans-Atlantic service from Glasgow to New York (Newark). There are also a number of other routes via Birmingham to Brussels, Channel Islands, Milan, Toulouse and Shannon. Following the trend of airlines to use lower-case initials for their name, bmi has a direct service from Aberdeen to Esbjerg in Denmark, from Glasgow to Copenhagen (in co-operation with SAS) and Jersey plus Edinburgh to Brussels, Copenhagen (in co-operation with SAS), Frankfurt (in conjunction with Lufthansa) and Jersey. Various other European destinations such as Dusseldorf, Hamburg, Munich, Nice, Paris, Stuttgart, Toulouse and Washington can be reached via English airports. City Star Airline is the UK trading name of the Iceland-based company Landsflug EHF. A service between Aberdeen and Oslo, Norway, began at the end of March 2005 and from July 2005 there was a service between Aberdeen and Blackpool in Lancashire. From April 2003 Czech Airlines has been providing the first direct airline service between Prague and Edinburgh. This is a major and vital new link between two of Europe's most beautiful cities which will open up new opportunities for business and tourism in each country. Operates a daily, year-round service from Glasgow to New York/Newark, New Jersey, USA. A weekly direct service between Glasgow and Dubrovnik on the Adriatic coast operates in June and July - although the service may be expanded. 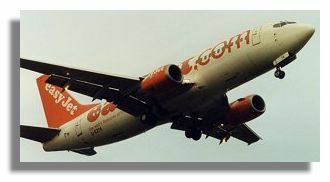 One of the first budget airlines to start operating in the UK, in addition to services from Scotland to the south of England, easyJet flies direct international flights from Glasgow and Edinburgh to many European destinations. The company took over GO, another low-cost carrier, in 2002. Daily flights to Dubai from Glasgow airport started in April 2004, the first direct air connection between Scotland and the Gulf. The airline offers quick connections onwards to destinations such as Australia, New Zealand, Hong Kong and India. Direct flights from Glasgow to Douglas, Isle of Man. Direct flights from Edinburgh to Helsinki, the capital of Finland, commence in April 2006 allowing for connection to the airlines Far Eastern destinations such as Beijing, Shanghai, Hong Kong, and (starting September 2005), to Guangzhou in southern China. Originally a business travel agency, flyglobespan.com was launched only four years ago, but it has already grown to be the largest Scottish-based airline, with twelve aircraft serving tourist destinations in Europe and Florida - see Table. But by 2007 the company plans to expand to a fleet of 19 aircraft. That will make the airline larger than Icelandair, which has been in the business for many decades. This new carrier flies direct from Cologne-Bonn in Germany to Edinburgh. This airline has been providing a stalwart service between Glasgow and Reykjavik, the capital of Iceland (and on to New York) for decades. Stopping-over in scenic Iceland while crossing the Atlantic between North America and Europe is certainly one way of breaking the monotony of this long-distance route. The Holland-based airline provides a service between Aberdeen and Amsterdam. German carrier Lufthansa has a direct service from Edinburgh to Frankfurt in Germany. Monarch Scheduled (an arm of the airline which has been operating flights fot package holiday companies for many years) is to fly four times a week from Aberdeen to Malaga on the Costa del Sol from November 2005. As well as allowing Scots to fly to sunny Spain, the budget airline estimates that about 15,000 tourists will fly from Iberia to visit the north-east each year as a result. Direct flights from Glasgow to Lahore and Islamabad, via Dubai, commenced in November 2005. Low-cost Irish airline Ryanair is based at Prestwick Airport and flies to a wide range of destinations, on occasions using smaller airports some distance from the main destination city. - see Table. Scandinavian Airlines (SAS) fly from Aberdeen to Bergen and Stavanger in Norway with onward flights from Stavanger to Copenhagen, Oslo, Stockholm, Trondheim and Kristiansund. The direct Edinburgh to Copenhagen service has onward connections to Oslo and Stockholm while the Glasgow to Copenhagen route goes onward to Oslo, Stockholm and Bergen. Formerly Duckling Airways, this airline is a subsidiary of Stagecoach, the Perth-based transport company. It operates services to London (City) airport from Edinburgh and Dundee (Riverside) airports. The Belgian national carrier Sabena used to operate a direct service between Glasgow and Brussels but when the airline went bankrupt it took four years before SN Brussels filled the breach with a regular service to the Belgian capital. The low-cost Swedish airline Snowflake will fly a twice-weekly service between Inverness and Stockholm from March 2004. The airline will operate return flights on Mondays and Fridays. Their one-way fares will start at £45 and will be operated with a Boeing 737-600 aircraft. A daily direct service between Glasgow and Philadelphia is to start in May 2004, running until October. US Airways can offer 45 onward connections across the US, Canada and the Caribbean. The oil industry has prompted this Norwegian airline, a member of the SAS Group, to introduce services to Aberdeen from Bergen, Stavanger and Sandefjord in Norway. 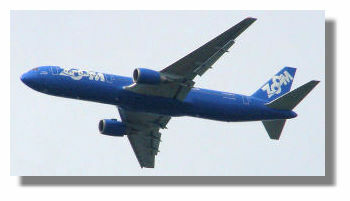 Budget Canadian carrier Zoom plans to start services in spring 2004, connecting Glasgow with a number of Canadian airports including Toronto, Ottawa, Halifax, Calgary and Vancouver. Don't forget that the narrative information has been collated into a Table on a separate page.